I don't know if I can judge this one accurately. I really like this film, as scripted by James Goldman, the author of "The Lion in Winter" and "They Might be Giants", and scored by John Barry of the 130+ composing credits, but most people are unaware of this movie's existence, despite the fact that it pairs up two of the greatest stars in Hollywood history, and represented Audrey Hepburn's return to the screen after nearly a decade of retirement. Sean Connery plays Robin Hood as an old man here, embittered by the crusades, disenchanted by the bloodlust of his crazy king, and trying to tie together some of the pieces of his ideals. The familiar characters are also still around, including Rob's old nemesis, the Sheriff of Nottingham. The film features an engaging performance from Robert Shaw as the sheriff, who is malicious, but also honorable, respectful, and probably the smartest man in England! For male viewers, the most interesting thing about the movie is the insights it offers into the nature of heroism. The point is that Robin and the Merry Men were heroes because of what they believed in, and their courage, not because they won all the time, and not because they could shoot the straightest and run the fastest. At the point in their lives pictured here, the gang can't jump fences or climb walls any more, or do much of anything that requires physical exertion. Their efforts are sometimes comical. They lose. But they are still heroes because of what is inside of them. Female viewers may tend to view it more as a love story, because Robin and Marian fall in love again, and who has more charisma than Hepburn and Connery? It was Audrey Hepburn's comeback after nine years out of the public eye. She looked beautiful and she was cast to perfection as the aging Marian. The ending always gets to me. Robin and Marian lie dying when Robin shoots an arrow out of the window and says to Little John ,"Where this falls, John, Put us close, and leave us there." The film ends focused on the arrow in flight. 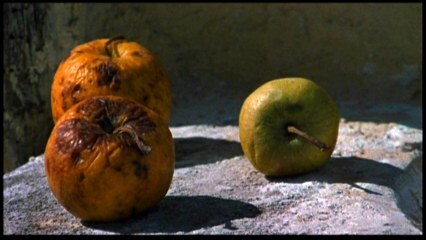 Then the closing credits roll over an image of three withered apples (right). 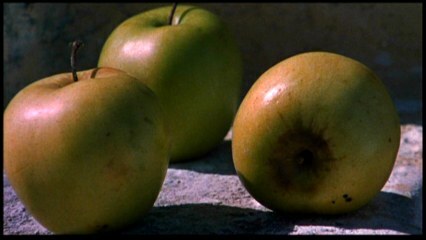 The backdrop for the opening credits (shown on the top of the page) had been three ripe apples. I like to see a little of that visual poetry in films. It seems to me a good thing when film recognizes that it is the literary medium of our time, and not just an entertainment medium. Widescreen anamorphic transfer, but no features. Robin and Marian is not a great film ... not a Grand Illusion or anything, but just a nice execution of a simple, touching concept. This may also be the most complex and real characterization Connery ever brought to one of his larger-than-life heroic roles. Unless you count Darby O'Gill, of course. Director Richard Lester was an interesting and complicated guy. He had a very solid career, directing such excellent and diverse entertainment pictures as Help!, A Hard Day's Night, Superman 2, and The Three Musketeers. When one of his actors died during a 1989 filming, he vowed to quit directing, and did. With their votes ... IMDB summary: IMDb voters score it 6.6. Based on this description, this film is a B-. It is a forgotten classic with uniform appeal spanning all ages, spanning genders. Or maybe it's a film that I love more than I should. One or the other.